My mother bought her crystallized ginger for her Raspberry Ginger Cake from Craig Van Laanen at Savory Spice Shop in Huntersville, North Carolina. Mom bakes recipes that I post on the blog and, because she does not want to eat the entire dessert, she shares it with others. In this case Craig after having been given his share wrote about the cake in his newsletter, something I was thrilled to read. It was only fitting that when I went to Huntersville for a day, Savory Spice Shop was my first stop. The layout is fabulous and extremely user friendly. Lance was working the front of the store, when we arrived and gave me quite an education about the various sea salts and chilies they carry. Then it was on to my favorite section…baking. So many oils, spices and blends that it was difficult to decide what I wanted/needed to bring back home. Ultimately, Shoshana and I tasted the Vanilla Bean Sugar and the Spiced Vanilla Bean Sugar (vanilla bean sugar mixed with cinnamon, allspice, mace and cardamom) and I knew the selections had been made. I thought they would be delicious sprinkled over Sugar Cookies. There is one itty bitty issue: I must confess I do not love rolling out cookies. It may seem kind of odd, given that I blog about desserts, but this is one of the few things in baking from which I don’t get tremendous satisfaction. Yet, I decided to take one for the team, because the sugars were too fabulous to sit idle. I did not make the cookie dough overly sweet, feeling that there would be plenty of sweetness coming from the sugar on top. Turned out to be a good call, if I say so myself. I tried rolling the dough to a few different thickness sizes and decided that this is a personal preference. 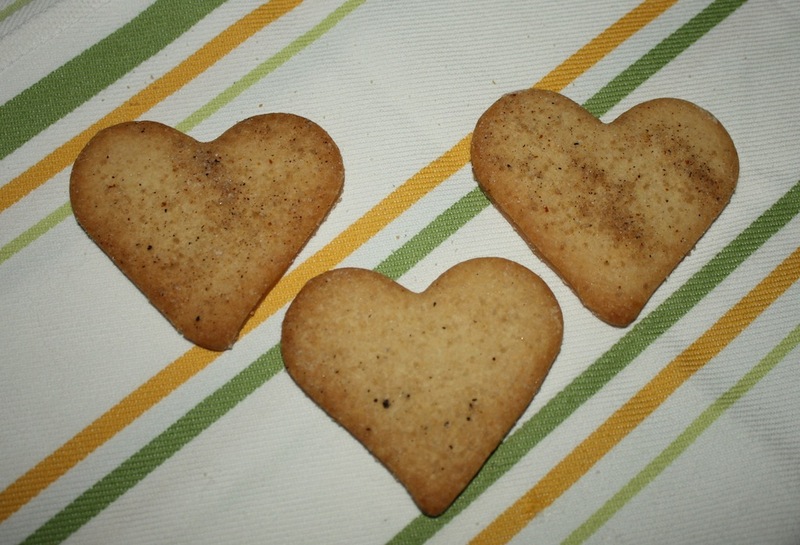 For me I love thinner cookies and want them baked until they are a deep golden brown. Others love their cookies baked thick and on the pale brown side. The only important thing to remember is that if you have thicker cookies, they must bake through. I sprinkled half of the cookies with Vanilla Bean Sugar and half with Spiced Vanilla Bean Sugar. Both were equally delicious. On some of the cookies I sprinkled both sides with the sugar. This, too, comes down to personal preference. If you are like me, and not inclined to make your own vanilla bean sugar or spiced vanilla bean sugar, Savory Spice Shop ships its products at a very reasonable cost. Just give Craig a call at 704-997-6133 or order online at Savory Spice Shop. I did not want to travel with mine, so I asked Craig to ship the sugars, salt and spices, which I had bought. It could not have been easier. Kind of like the cookies I dreaded making. Whisk together flour, salt and baking powder and set aside. In a mixing bowl, cream butter and sugar until light and fluffy, about 3 minutes, scraping bowl down as needed. Add dry ingredients and mix on low speed. Lastly, mix in egg and vanilla extract until well blended. Form dough into a disc and wrap in wax paper. Refrigerate for 1 hour (longer if necessary). Preheat the oven to 350°. Line baking sheets with parchment paper and set aside. Divide dough in half. Roll dough out between sheets of parchment paper. Roll with the rolling pin a few times then lift the parchment paper and place it back down before continuing, so that the paper does not crinkle into the dough. Also, shift the dough periodically for even thickness. Roll to thickness of between ⅛” and ½”, depending on personal preference. Use cookie cutters to shape cookies. Place on prepared pans. Sprinkle liberally with Vanilla Bean Sugar and Spiced Vanilla Bean Sugar. Bake until the cookies are golden brown or pale brown if this is your preference, between 14-20 minutes depending on thickness. If baking 2 sheets at a time, rotate the pans (front to back and top to bottom) halfway through. Vanilla Bean Sugar and Spiced Vanilla Bean Sugar are available at specialty food shops. I order mine from Savory Spice Shop in Huntsville, North Carolina. They ship nationwide. The recipe may make more or less than 50 cookies depending on the cookie cutters used. For a more intense flavor, sprinkle Vanilla Bean Sugar and Spiced Vanilla Bean Sugar on both sides of the cookies before baking. Additional time is needed to refrigerate dough. Hi, Betsy! Saw your post on CCN. $7 for 3.5oz?! Yup, I would def not want to waste it! I am one that prefers the thicker, chewier cookies ;). Love the step by step photos! When I become a mother, I would roll out the dough just so my children can have some fun with it ;). Love that this was a collaborate effort between you and your son. I love time in the kitchen with Samuel and watching his love of cooking and baking grow. You are spot on about the sugars. They are delicious, just too expensive to substitute cup for cup.